The critical part is to encode in a progressive codec. HDV is interlaced. When using the Main Concept codec go to the Video tab and select Output Type MPEG-2. WMV and MP4 are always progressive. If you're looking for a simple 2D animation package look no further! CreaToon is great for simple cutout animation like talking heads. Before I found this I was going to use Blender 3D and learn all the rigging. It saved me some time coming up with a funny effect I wanted. CreaToon can take most image formats such as JPEG, Targa, and PNG. I like PNG as it allows for Alpha Channels to make the background transparent. This means I could edit a graphic using Paint.NET then animate it. Attaching the body parts of an animation is easy to follow through the online tutorial. Within half a day I had a minute long voiceover and animation sequence working together for my cutout characters. With the sequence done I was able to put it in front a green background and export to AVI. Imported into Sony Vegas I applied a Chroma Key reapplied the audio and was all set. CreaToon was also capable of exporting image sequences but this method seemed easier for my style of editing. Here's my attempt at the 300 style special effect. It works quite well for the HV20 with its high resolution picture and choice of manual settings. Good light is important to allow TV-500 or TV-250 mode. This eliminates motion blur. Shoot from a stable platform to reduce obvious rolling shutter. Then capture your 60i. Convert your 60i to 60p using your choice of deinterlacer. Smart Deinterlace based on VirtualDub's works quite well. As for the codec, choose one that supports 60p such as Lagarith/Uncompressed AVI, WMV or H.264. Then feed the clip to an NLE that can do velocity envelope/time remapping. Speed up/ramp up the broad movements while at wide. When you find the terminus of an action, back off a bit then slow down to at least half normal speed (I like to go down to 0% in a V or U for Vegas velocity envelopes). Keep that for a few seconds then return to normal. To accentuate the slow mo portion, use digital zoom to the area of action. To SLR users a macro tube is just what it is, probably. Unfortunately that doesn't help me. I bought two different tubes in Ebay hoping one of them would have a standard 58mm thread. Sadly one of them had an odd 52mm male thread while the other used a 57mm female thread! Not being one to give up I scoured the internet for ways to use these tubes. And the way was the reverse macro coupler. Sure it made the project more expensive with each new part but it salvaged an otherwise difficult situation. This macro tube was manufactured in India and is sold by a US supplier from Ebay. At $10 plus shipping it was interesting to try. Upon receipt it was confirmed to have a 52mm thread diameter. The threads between spacers is female on the back and male on the front. If you think about a UV filter, you would screw it in with the filter's back thread. This makes the inner diameter 52mm facing the wrong way. Fortunately 52mm is a standard size. To mate this with the camcorder I bought a 52mm-52mm reverse macro ring. This ring is male 52mm on both sides. 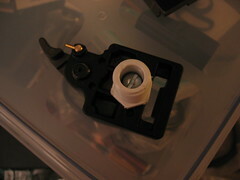 SLRs use this to hook up a lens in reverse format to use as a magnifier. 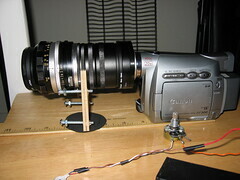 From the macro ring, any XXmm to 52mm step up or YYmm to 52mm step down ring can mate with the camcorder lens. 52mm is pretty narrow for focusing screen. 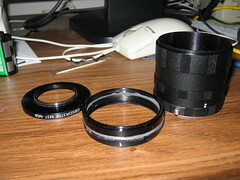 The Nikon F3 Type D focus screen barely fits inside the tube. With some art foam I was able to get the screen to fit snug. This pretty much makes the tube suitable for a static design. Note that the tube isn't smooth. 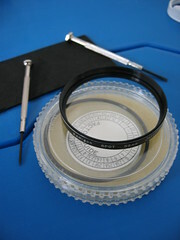 The outer diameter of the tube is still 58mm and the inner approximately 55mm. But on either end of each spacer is a 52mm inner thread. Think of a built in step down! Putting a vibrating motor or a holder will be a challenge due to small tolerances. Perhaps the chinese manufacturer has a 1mm variance. I was really hoping the tube had a standard 58mm thread. But no it had to be 1mm short. Externally the tube is still 58mm. 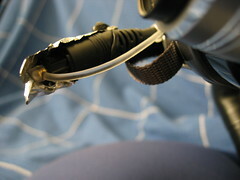 But the connecting threads (male receiving, female connecting) are too short to allow hooking up any sort of reverse ring, filter, or step ring. 57mm isn't a standard filter size. There were filters of this size in the history of single reflex cameras (ancient history in tech terms) such as the Bay 7.5L (maybe sometimes B57) but these don't end in a standard size thread nor are they easy to find. Short of machining one the next best thing is to adapt the thread using a sacrificial 58mm filter or step-up ring. I go with the filter. Though I have various XXmm to 58mm step up (you can't use a step down because there's not enough contact space) I don't want to get stuck should I need to put a macro in later. So off to Ebay I went to seek the cheapest one with a metal ring. Then off the the hardware store to buy some strong epoxy. I'm still waiting for the filters to arrive, but I plan on removing the glass (minimize internal reflections) before gluing it on. So where can you find a tube with a standard 58mm thread? The ones sold from Hong Kong and China are probably a hit or miss deal. I even called Fotodiox and asked a sales representative (they were very accomodating!) to try their tubes if they had 58mm thread and they were just a hair short as well. The static showed its grain when used outdoor with iris at full open. When the static is complete it needs to have all the openings sealed from light and dust. 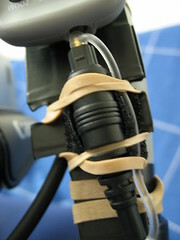 A brace also needs to be made as the camcorder's threads probably can't carry the weight of the lens assembly. This was a really simple build with better results than the spinner that is still half finished. I can't take that much credit for it. I think the condenser on the Nikon Type D has a lot to do with it. I took the macro tube and stacked it with 1, 2, 3. In ring number 3 I put a ring of art foam to cover the space. Then another layer of art foam was wrapped around the focus screen so pushing it in braced the screen into the tube. With this macro tube stacked this way, the edge of the ring threads comes to about 46.5mm! Simple as that. 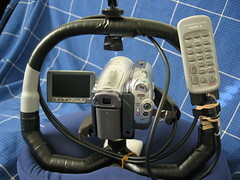 Hook up your choice of Nikon lenses and setup the camcorder. Zoom in and press record. 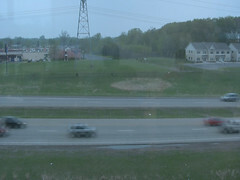 The video was extracted from DV and then rotated 180 degrees. It was recompressed with ffdshow to fit in youtube size. The static grain isn't as obvious because of the downscaling (720x480 16:9 to 360x240 4:3). The washed out colors has more to do with the shooting environment and the single CCD camera. It was shot indoors during a rainy day. The trick to getting the ZR200 to focus is to have something bright in front of the lens. 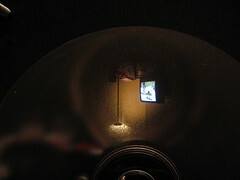 The grain on the Maxell CD is a good point for the camcorder to focus. Then set it to manual mode. Zoom in to frame the good part of the image. The grain on the spinner is very visible when static. It is still visible while spinning slowly. In this test, the disk was spun by hand. The 35mm lens was a Nikkon Series E 50mm f/1.8 prime. The pulsating of the image is my fault. 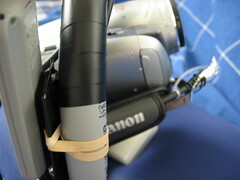 I had not mounts so the camcorder was held an inch from the ground glass by hand. I am being silly again. Testing the ZR200 with various zoom settings and manual focus proved that the 28mm lens on the camcorder is able to focus on objects very closely. The trick was to have something with good contrast in front of the ground glass while adjusting the zoom and focus. The seller for my binoculars ran out of stock. Might as well, I just learned that there is some color casting from those front lenses. Sourgrapes? Probably. On a brighter note, I have some parts coming in for the second prototype which will be a static/vibrating gg based around a Nikon F3 Type D focus screen. This focus screen is thicker than the Canon Ee-A that other builders use because it has a built in condenser. The condenser is a plano-convex (PCX) lens that magnifies the amount of light that goes to the focus screen. That's a lot of big words! Not that I know a lot about optics, I'm still learning what it all means. I should explain it some more on this blog as each concept is understood by me. But the PCX simply means that the image that gets on the focus screen is brighter. 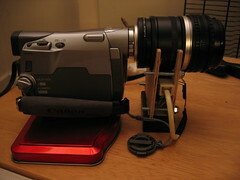 More light to the focus screen makes it easier for the camcorder to record an image. The Type D focus screen is, incidentally, a favorite for astrophotography. And it is supposedly has such a fine grain that it could be used static. The static design is based roughly on the aldu35. This was a parallel development for the spinning agus35. The aldu35 was later improved by having the gg vibrate to blur the grain. All this talk is making me anxious. I sure hope that +10 Macro comes in soon so I can have prototype 1 working. And so begins the search for a magnifier. The terms Macro, Close-up, and Diopeter get thrown around. The filters that screw on to the lens is usually called a close-up lens. Sometimes a Macro. Diopeter (literally means power of magnification) is rarely seen. But if you get the chance you want an achromatic close-up. The folks at DVInfo.net talk about custom built 72mm achromats for HD work. Others talk about really expensive +7 Century Optics achromatic close up but they're not entirely happy with it. I've heard of Hoya +10 (AC) close ups which some people consider okay for SD work but its not cheap either. What's all this lingo and how does it matter? First of all lets think of what a macro does. 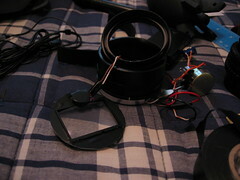 It's a magnifier so the camcorder's lens can focus on a object closer that it normally can. 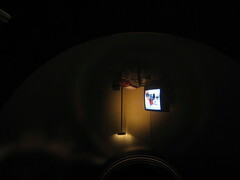 The power has to be high enough so we can get the magnifier closer to the ground glass which is our subject. So we want a +7 or +10 power (or diopeter) magnifier. You can stack magnifiers like a +3 and +4 but this causes recordable light to be lost. We want to keep as much light as possible so I decided on a +10. Speaking of light, that's what the coatings are for. The better the coating the more light is allowed through the filter. That's why some lenses are cheap and some are very expensive. The expensive ones supposedly let 99% of light to go through. Less expensive multi-coated ones let 97% and so on. When you magnify an image you multiply flaws. This includes an effect called distortion and chromatic abberation. If you take a regular handheld magnifier you'll notice that the image is sharp in the center and gets stretched out as you get to the edges (distortion). The colors also gets a bit off like a badly tuned TV (ghosting). Now if you have a big enough magnifier you may be able to compensate for distortion by focusing on the center sweet spot. For the ghosting, most recommend to get an achromatic diopeter. This is a two lens magnifier that cancels out this effect. Since those are expensive and we want to experience build it yourself, we're going to have to make compromises. Just to be able to test, I ordered a +10 Closeup made by Bower. Bower is supposedly at par with Hoya standard coating filters. Since I'm using an SD camera it should be good enough. But for later I really want to try an achromat. So I go buy cheap binoculars. Say what? Yes, binoculars. 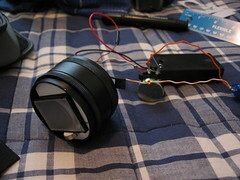 The front lenses taken out and facing each other can be used to build an achromat. All you need is a holder and some glue. It'll make a nice challenge. At the end of the day all this experimentation maybe just a bit shy of buying 1 tested commercial product. But that's 1 versus many. And the comparison is great for learning. 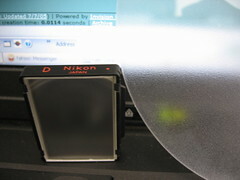 Sharp focus was fairly easy to eyeball on the spinning gg and the Nikon F3 Type D focus screen. Just move it closer or further until you get a sharp image with the lens set to infinity. 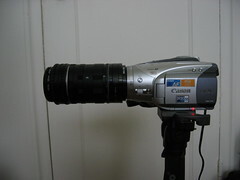 The tricky part was getting the camcorder to focus on the ground glass. What the human eye can see sharply does not translate to what a single CCD camera can see. It's a very small target (maybe half an inch high and an inch wide of good image) even for the small 28mm lens on the Canon ZR200. Using the Canon S410's video mode wasn't any good since there is not way to engage macro and photo at once. 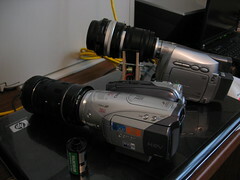 I don't know too many camcorders with a macro mode so I probably will need a set of macro lenses. The spinner is half-built. I have to look for Macro lenses to help the camcorder out. At first I thought to just go out and buy 28mm close-up (I don't mind chromatic aberation at this point). But then I thought that a macro lens like any other magnifier will look warped unless I get a bigger lens. I don't know if that's right but it probably won't hurt. At least I hope not. I have a half working prototype now. Since its night and indoors the furthest my infinity focus can go is the door. I don't know if this is it or something else, but instead of the 46.5mm distance I was expecting for F-mount I had to use 40mm distance between back of lens to frosted side of ground glass. There was trouble focusing on the ground glass while zoomed in. The human eye can resolve the detail but the Canon ZR200 and S410 would just record points of light. Maybe I need a macro or an achromatic diopeter. But that will have to wait. 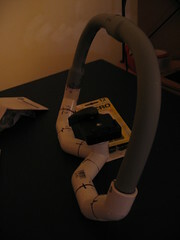 I can't even prop the device up right now for lack of ballast and screws. At wide-angle, you can focus on a subject as close as 1 cm (0.39in.). I was hoping that I wouldn't need a macro (I also hear the term relay lens -- could this be the generic term) because my lens was less than 43mm. 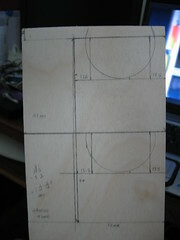 After carefully drilling the center and pilot holes I set the circle cutter to 2cm. Control was difficult at best when cutting three stacked boards. The result was a poorly controlled cut that was too wide to put the mounting screws. I had enough board left over to make a patch panel but that messess up the even alignment of my screws. DIY is full of challenges. You can't do the job right without the tools. 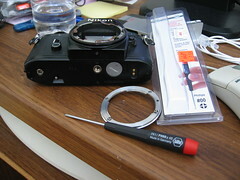 I had to buy the philips #00 screwdriver to remove the screws from the camera body. Fortunately the local Ace Hardware sold it in singles since I already had toolkits with other sizes. For cutting plastic and plywood, choose your poison. I have a Dremel XPR 400 with a circle cutter to make my circle cuts. It's also possible to do the job with a box cutter if you don't mind taking a while to cut through plywood. I would have used particle board but I couldn't find any. At one point I considered using carton but I was worried my screws wouldn't hold on that material. It would still work with glue but I want to prototype first. The sandpaper is good for removing burrs on wood and plastic. As for the Metric ruler, its just easier to deal with millimeters than fractions of an inch for precision work. The eye protection is standard but shouldn't be ignored! I chose to go Nikon by recommendation. The F-Mount has been around a long time. Lenses are fairly easy to find. Most people start with a prime lens (as opposed to telephoto/zoom and wide lenses). 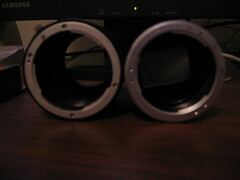 A lens from f/2.0 to f/1.4 (lower is better) is considered fast . The 50mm f/1.8 prime lens is most common and should be available from Ebay and various camera stores used. If you're lucky you can buy a complete vintage film SLR camera with a good prime lens for cheap (<$50). There are f/1.2 and f/1.0 lenses but these are very old discontinued lenses that fall in the category of legend and luxury. When buying a lens its important to make sure there are no scratches or fuziness. If the lens needs cleaning or ever had fungus then its no good. As for the funny acronyms such as NAI, AI, AIS, etc. If it says F-mount somewhere and says manual it's good for our purposes. If the age indicated is 1977 or later you should be confident. The variations refer to how the mechanism control focus. We won't be using any of those functions. Unless you are a wiz at disassembling SLRs there's little chance of every using autofocus mechanism on these cameras. So go cheap and simple. 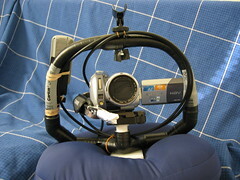 We have to mount the camera lens to our aparatus somehow. There are many options for getting hold of an F-mount. The last option is the cheapest. I don't know how well it will stay fixed since it will have to be glued. You also need to cut out the bottom to make a hole. An original Nikon LF-1 will set you back $9 to $12 plus taxes/shipping. You can get really cheap third party ones from Ebay for $5 shipped if you know where to look. Or you may be able to beg one off your camera friends. Personally I like to use screws more than glue. Glue is tricky to adjust because I work slow. So I bought an old circa 1979 Canon EM. It had a 50mm f/1.8 Series E lens and the four screw F-mount. I may have to supplement the screws with glue later on but that only makes the job easier. Since my first prototype will be a spinner I don't need the fancy tube style adapter. Supposedly there are nicely frosted fake CDs in the 25pk Maxell CD-R cakeboxes. Maybe maybe they were more abundant in 2004. But it's now 2007 and I had a hard time finding one. I used to have those frosted plastic disks that protected CDs/DVDs in a cake box. Just last year I threw out my empty spindles with those non-crystal blanks. Little did I know that I might want them a year later. In desperation I tried to sand my own ground glass from some crystal DVD-R blanks. Not having any 1500 grit wet dry sandpaper handy, I used a sheet of metal sandpaper that was lying around from repairing some car rust. This was Norton brand from the Home Depot with no grit rating on it. It was marked "fine" which I guess is about 100-200grit. Apparently, "fine" wasn't fine enough as I tested my poor groundglass. The light loss was horrendous. So I scoured several stores to find the elusive ground glass (gg). Walmart had 25pk Maxell CD-R but these were the 'printable' type. Looking through the top I couldn't tell if there was a frosted there. This was not to be mistaken for the CD-R Pro with its gold surface and no frosted cd. There were several cakeboxes by Memorex, Sony, TDK, and Imation but none of them had it. Once I got fooled by the milky translucent look of the Memorex 15 pack so learn from my mistake. 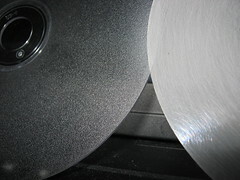 The best bet is to look for silver top CD/DVD. The clear cakebox is an even milky color but the frosted blank will make it look rough and spotted. It will look like it has dust particles around it but its somewhat evenly spaced and distributed. Best Buy, Circuit City, CVS, RiteAid, Radio Shack, Target and the local supermarket saw me inspecting every brand they had. Even among Maxell brands you must beware. I think the trick is to find a place with old stocks of CD-Rs. So I went to a lonely FYE near a huge Barnes and Noble. In a corner mixed in with white and blue-green 50pk Maxell CD-Rs was one cakebox of its older stock. Instead of the 56x, I grabbed the 40x all green 50pk Maxell CD-R box. The cover was a bit dusty so I had to really examine the top against the light. Seeing the small white dots and bumps told me it had a frosted CD. Back home there was a cheap Durabrand CD player. Little did it know its life as a portable entertainment device was coming to a close. To record our field games I bought a cheap Mini-DV camera. We were going to make a nice group video to commemorate the year and I thought it would be nice to do film-look with shallow DOF. 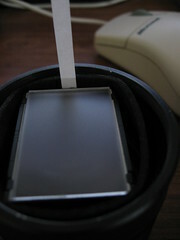 So I read up on how to do it, and bought a bunch of Neutral Density filters to control the f/stops. But we never got time to try it since we were busy running around the game field. It didn't help that the camcorders pulled double duty as helmet cam recorders. Anyway I never got to try the filter technique but still went ahead with the video. Some lucky angles and amateur composition took out most of the distracting elements in the image. Queue in a good story and dramatic soundtrack to top it all off. The video was done but not as nice as we want it. Now we're embarking on a new endeavor. We're setting up video reviews of game gear so I'm back at the DOF question. My brother has been using DSLRs and is pretty good at it. He pointed out 35mm DOF adapters from M2. From there I backtraced it to the Agus35 documented in dvinfo.net. Yippee! Another topic for my evil experiments! Soon I shall flood the world with exceedingly bad and cheesy videos! This blog is my notebook for all sorts of little projects. I'm in a a do-it-yourself phase. 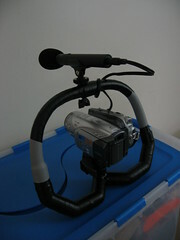 Last year I built helmet cameras (can't stop with one) and pneumatic cannons (more than 1 as well). For this part of 2007 I'm looking into 35mm Depth of Field. I'm going to hook it up to every imager I have and see if a film look will work nicely for my videos.